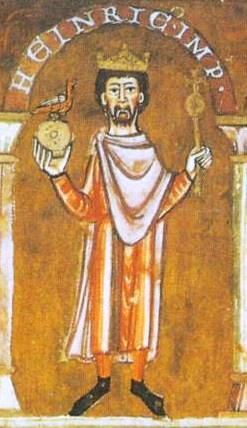 Henry IV (German: Heinrich IV) 11 November 1050 – 7 August 1106, ascendit tae be Keeng o the Germans at the age o sax. Frae 1084 till his forced abdication in 1105 he wis an aa referred tae as the Keeng o the Romans an Haly Roman Emperor. He wis the third emperor o the Salian dynasty an ane o the maist pouerful an important figures o the 11t century. His reign wis markit bi the Investiture Controversy wi the Papacy an several ceevil wars ower his throne baith in Italy an Germany. He died o illness, soon efter defeatin his son's airmy near Visé, in Lorraine.